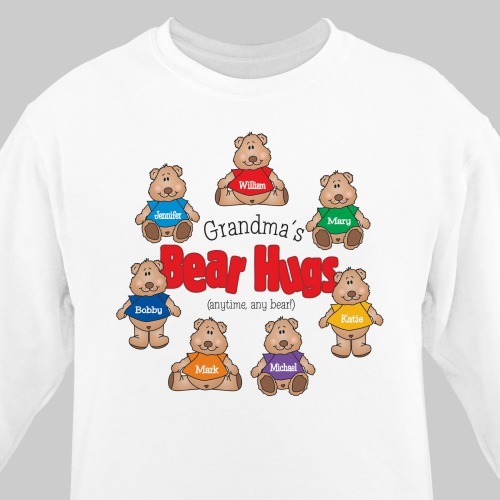 Show off being a Mom or Grandma with our personalized teddy bear shirt. 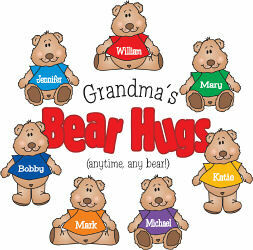 Proudly display your kids and grandkids each printed with their own teddy bear. These Personalized Grandma Shirts will be cherished forever. Custom Printed Grandmother Shirts are available on our premium cotton/poly blend sweatshirt, machine washable in adult sizes S-3XL please choose white or pink. Free personalization includes your choice of title like Mom, Grandma or create your own and up to 30 names each printed on their own teddy bear. Each name should be no more than 12 characters. Just love it. Had so many compliments on this shirt. Very happy, this is my second one. Had to add another Grandchild.